There’s not many things I remember about my Dad’s Mum, Grandma Dot, but I do remember her cooking, her laughter, her beautiful bowls, her family lunches (especially at Christmas) and her baking. OK, so I remember a lot. She was a country woman who grew up in Werris Creek NSW, met a local man, Frank also from there and started their married life together. They had two kids (my Dad one of them) and spent their married life living in Stationmaster homes at various stations in the area. I have vague recollections of their homes in the country, definitely the sound and smell of steam engines rolling past the house that made the windows rattle. Her shoe rack that hung on the inside of her wardrobe and at Christmas time the sound of Perry Como’s Christmas album playing on the record player. And you know what else? Fruit cake. In a tin. That would be cut up and had for morning or afternoon tea. SO many rock cakes and biscuits and baked delights that came out of those tins over the years – rainbow birthday cakes before they were even a thing – and that fruit cake soaked in sherry that I just have to smell now to be transported back to my childhood. They moved up to Sydney when they retired and that’s where I remember most of my time with them – playing in their pool at Dundas and eating passion fruits straight off the vine in our dripping swimmers on a hot summers day, sitting in their over heated lounge room doing crosswords, listening to the clicking of her knitting needles while the smell of roast potatoes and pumpkin cooked away in too much oil in the electric frypan. When she died my Grandfather Frank kicked on for a few more years and when he died my Dad and step Mum cleared out their house of a life’s worth of stuff. I was lucky enough to get a few pieces – an art deco cut glass mirror that hangs in our entranceway, some of her bowls that I remember eating Christmas pudding and custard out of, some vases and her fruit cake tin. A tin that I just thought was a regular cake tin until a little while ago when someone on Instgram pointed out that it was fruit cake tin…der! Of course! 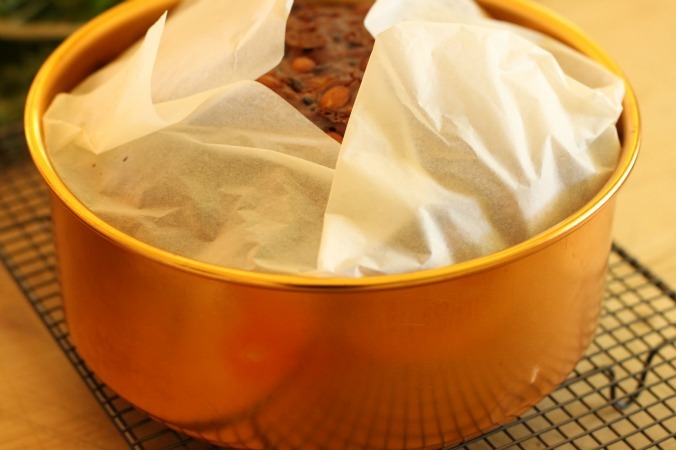 Ever since then I have had a hankering to make my own Christmas cake…but I didn’t have Grandma’s recipe and had no idea where to start plus I thought the whole thing was a little out of my skill area. It’s funny how we think these things with cooking don’t you think? It’s like me and pastry…far too scary! For the past 10 years we have been going up to Rob’s Dad and Step mum’s farm up on the mid North Coast of NSW and enjoying the Christmas cake from their neighbour Joyce…it reminds me so much of Dot’s and it’s been a joy to see my own girls delight in it for morning or afternoon tea which is a very serious business in the country. A few weeks ago I was listening to Richard Glover’s show on 702 and heard a wonderful woman on called Glad Chute, who had that wonderful whistle when she spoke. She had a fruit cake recipe that she had been making for years and had shared with 702 over the years that people raved about. She was so lovely, I knew this is where I had to begin. And so on Tuesday morning, I did just that. Started my very own tradition, that has to begin somewhere, thinking of the little one growing in my tummy, and of my Grandma Dot before me. That’s the thing with cooking and recipes…what a wonderful thing it can be to pass something on to generations through time…all connected by food, and love and memories. There are two stages to this simple recipe..and believe me while the list of ingredients might look long and foreign to you or me it IS simple…one is the cooking of the fruit and then the second is incorporating the wet and dry ingredients into this fruit. Then it’s thrown into a tin and cooked in a long and slow oven for 3 hours. I had both kids at school, Frank at my feet, a tummy full of ham on toast that I ate before I started and Bing Crosby crooning to me. I was SO happy! 1. 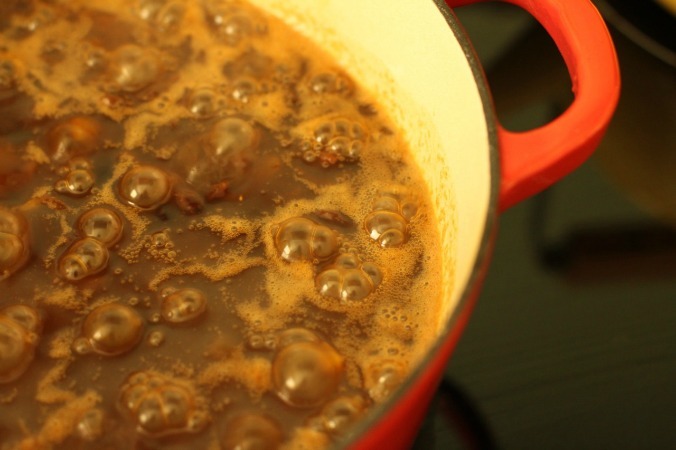 Put the first 10 ingredients into a saucepan then bring to the boil and boil for about three minutes. I literally threw it all into the one pot, whacked the heat on high and then turned it off after 3 minute boiling. I transferred it into another bowl to cool down a little quicker. 2. 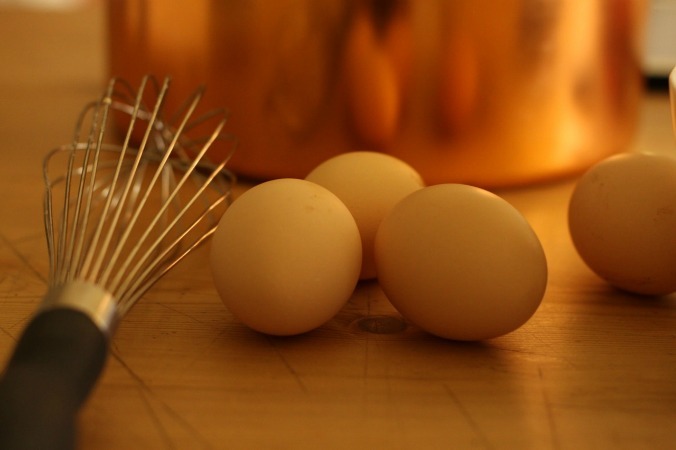 While this was cooling into a bowl I added in the eggs, the sherry and the essences and gave them all a good whisk. This then gets added into the cooled fruit mixture. 3. Now you need to really line your tin well. 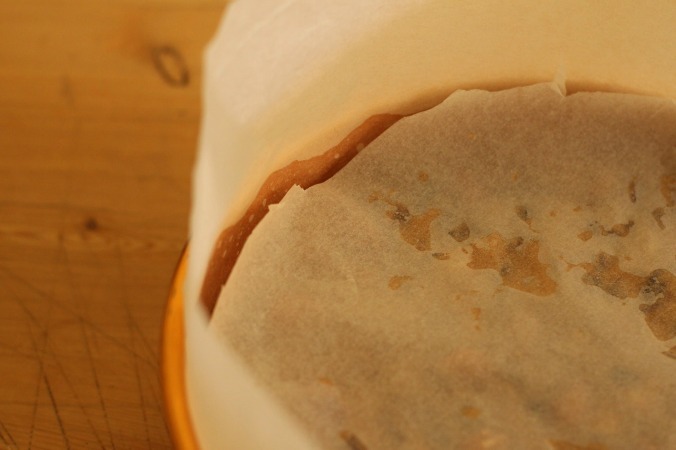 This means old school lining…perhaps even two layers of baking paper into a well greased tin allowing some extra out of the top of the tin. I draw a circle of the base of the tin onto the paper and then cut out for the base and then just a long strip for the sides. I had tips of cooking the cake on newspaper in the oven and brown paper on top to make sure it doesn’t colour too much. 4. 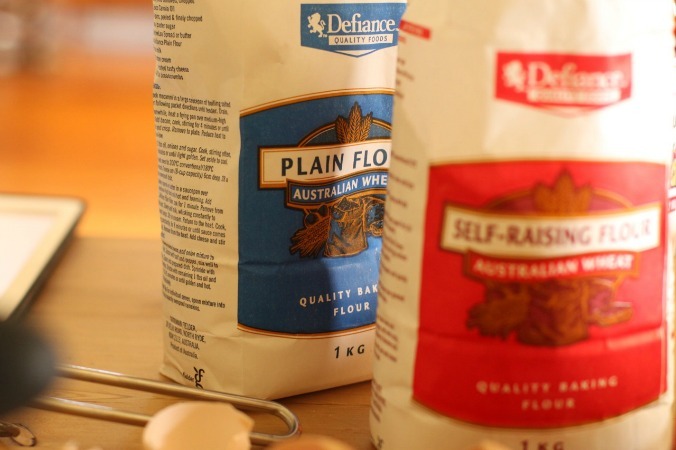 Now you need to get your dry ingredients sorted. Sift the flours, chop the nuts and dissolve the bicarb into the hot water and add it into the wet fruit & egg mixture, folding the flour in as you go. 5. Pour the mixture into the well lined tin and cover the top before placing into that 160 degree oven for 3 hours. I placed a few almonds on the top but you could go Christmas crackers with the decos…think red and red cherries a go-go! My tin was a big 23cm tin (this also would be enough mixture for 2 smaller 18cm/20cm tins). 6. After 3 hours take the hot cake out of the oven and pour over 3 tablespoons of sherry on top of the hot cake (it will sizzle away) and then let cool for a little while. 7. I then had school pick up to go to so left the hot cake in the tin cooling on a rack. When I got home I wrapped that cake in the tin in a bath towel, just as Glad told me to. She leaves the cake in the tin and the towel in her spare bedroom until she is ready to deal with it…that could be weeks later. 8. 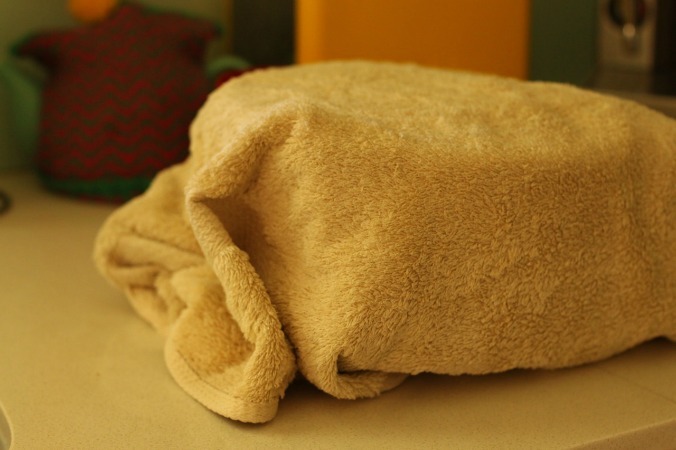 For me, the next day I unwrapped the towel and revealed the cake. LOOK AT HER! 9. Then she got wrapped into foil and placed into an air tonight container where she will sit until December. Obviously the longer it sits and lets all that fruit and booze mature the better…even up to 12 months! This will keep for a year also…imagine that! I have no doubts that it won’t last the month of December. 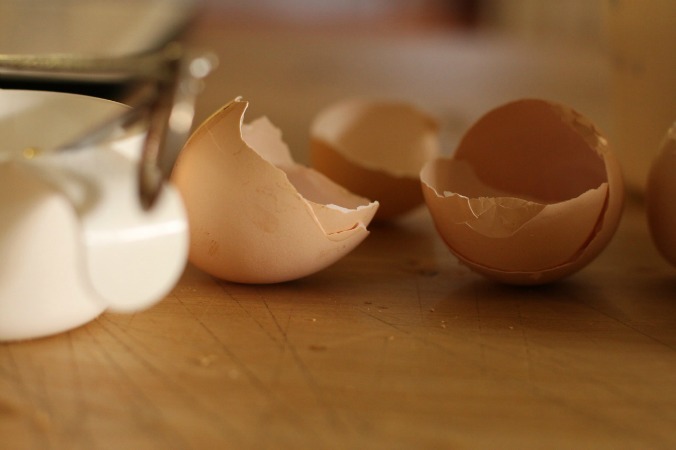 Put the first 10 ingredients into a saucepan then bring to the boil and boil for about three minutes. Leave to cool. 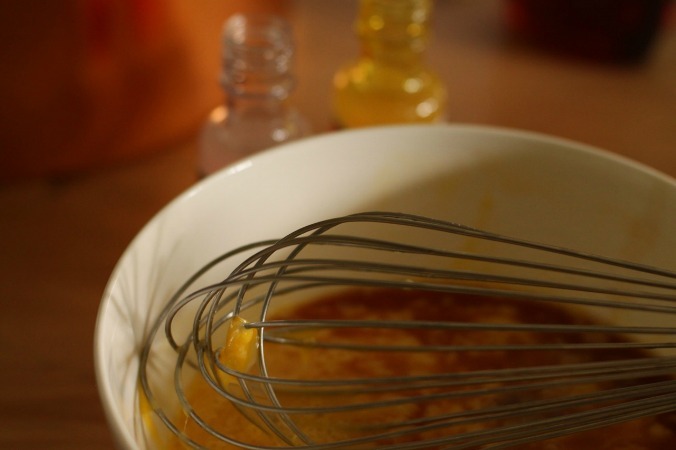 While this was cooling into a bowl I added in the eggs, the sherry and the essences and gave them all a good whisk. This then gets added into the cooled fruit mixture. Now you need to really line your tin well. This means old school lining...perhaps even two layers of baking paper into a well greased tin allowing some extra out of the top of the tin. I draw a circle of the base of the tin onto the paper and then cut out for the base and then just a long strip for the sides. I had tips of cooking the cake on newspaper in the oven and brown paper on top to make sure it doesn't colour too much. Now you need to get your dry ingredients sorted. 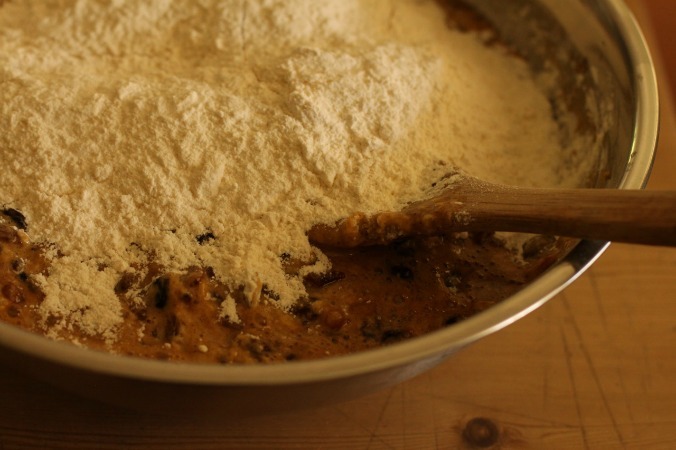 Sift the flours, chop the nuts and dissolve the bicarb into the hot water and add it into the wet fruit & egg mixture, folding the flour in as you go. Pour the mixture into the well lined tin and cover the top before placing into that 160 degree oven for 3 hours. I placed a few almonds on the top but you could go Christmas crackers with the decos...think red and red cherries a go-go! My tin was a big 23cm tin (this also would be enough mixture for 2 smaller 18cm/20cm tins). 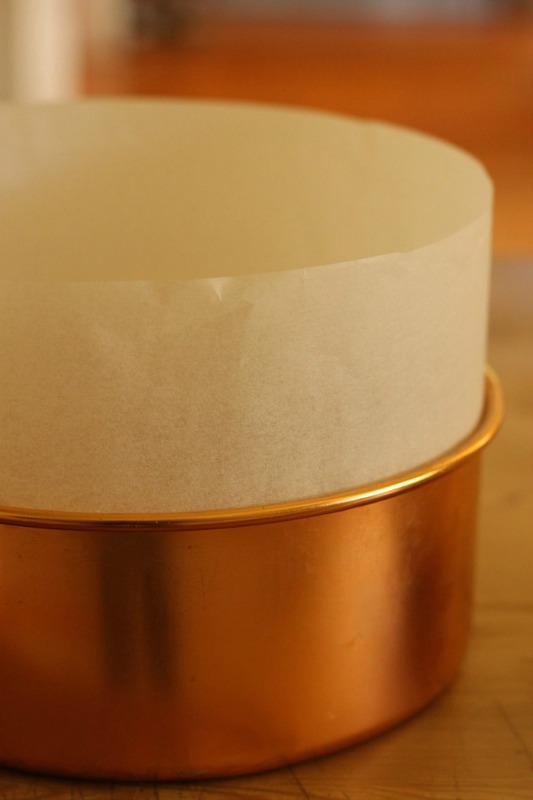 Wrap the cake in the tin in a bath towel. She leaves the cake in the tin and the towel in her spare bedroom until she is ready to deal with it...that could be weeks later. 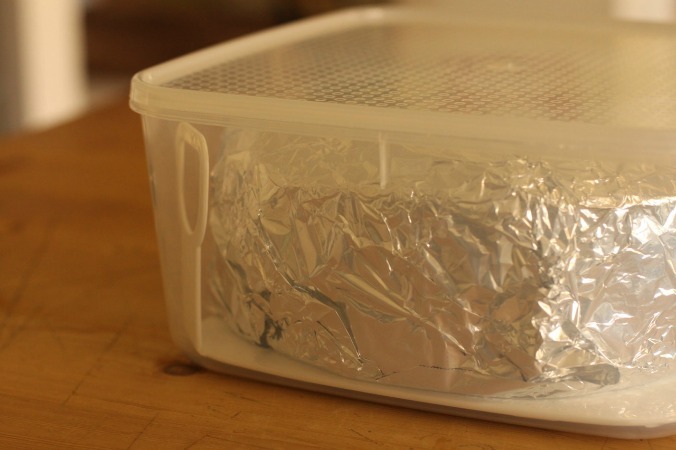 The next day (or it could be a few weeks later) take the cake out of the tin, wrap it in foil and transfer to an airtight container. So there we have it, a first Christmas tradition that I hope to do each year. I even went and got some more fruit the next day so I can make another one to give a bit off to all of our parents when we visit at Christmas. That tin washed out beautifully, and it’s been put away, happy that it’s been put to use again after all these years. I bet Grandma Dot was proud. 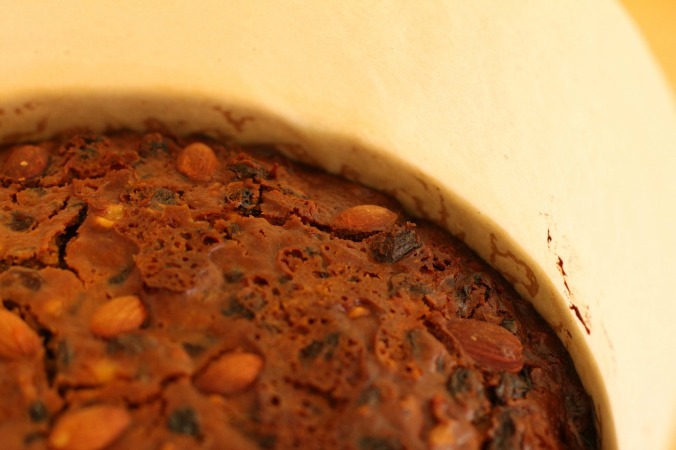 Do you make a Christmas cake or pudd? 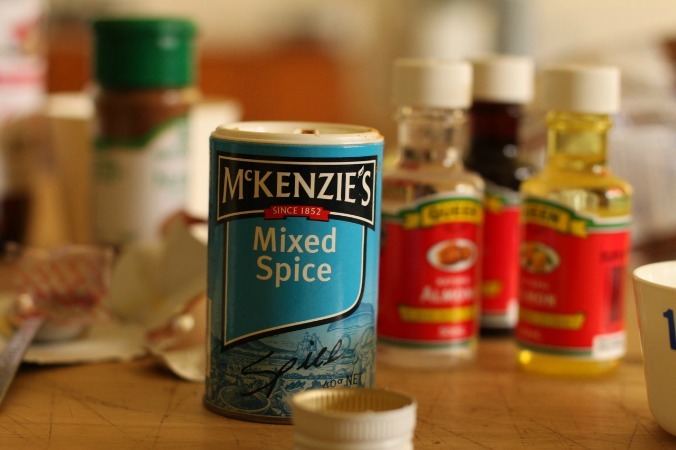 Got a family recipe or tradition that you follow? I LOVE people who have a whistle when they talk! Oh lady, so do I. I wonder if I will ever get a whistle? I can only hope so. We make Christmas pudding in my family. But this year I’m going to try my hand at some Christmas cookies! Any Christmas baking is a thing of joy! lovely insight into your granny’s life, beth! funny that whistling while speaking! … I haven’t got that yet?!? my mother was a good cook and always baked the traditional Christmas cake! my ex mother-in-law even made her puddings … also a brilliant cook, these two were especially good at deserts … love me a piece of rich Christmas cake! Right, I am on it this weekend! i hate fruit cake but i love tradition, especially Christmas tradition. Every year i make my Nans rum balls, i loved them even as a kid, my kids love them too, don’t tell the authorities that I let them have a rum ball or two on Christmas Eve. 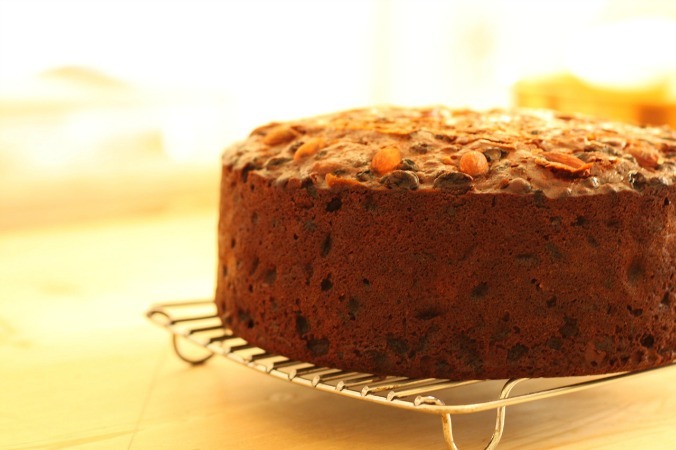 Oh there is SO much sherry in this cake and as for the amounts that just get poured over at the end – no wonder my kids are so happy at Christmas time! Thanks Emily! I’ll be making round 2 next week for sure! I love Christmas and especially the baking … My mum used to make us a tin of shortbread… Yes a tin. My brother and I would look forward to that I think more than the presents, now she to old so I have continued the tradition, even making different flavours. Enjoy your baking and traditions. 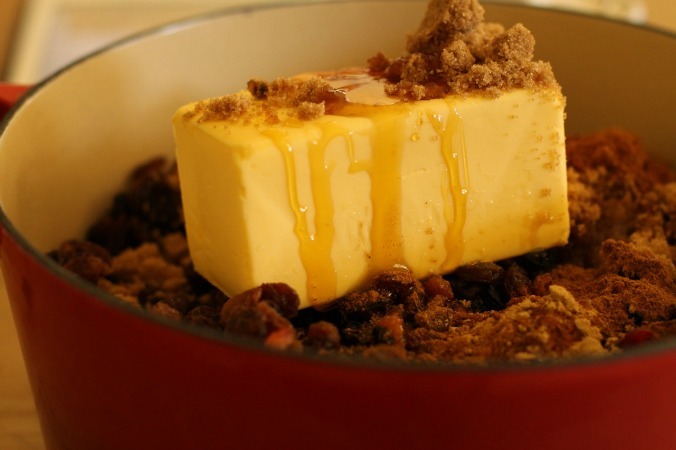 Thanks so much for this recipe, I’ve been thinking of making a fruitcake! Perfect timing! I could eat the boiled fruit mixture straight from the saucepan! Deeelicious! And I can tell you that I burnt my finger doing JUST that! The best! That smell! 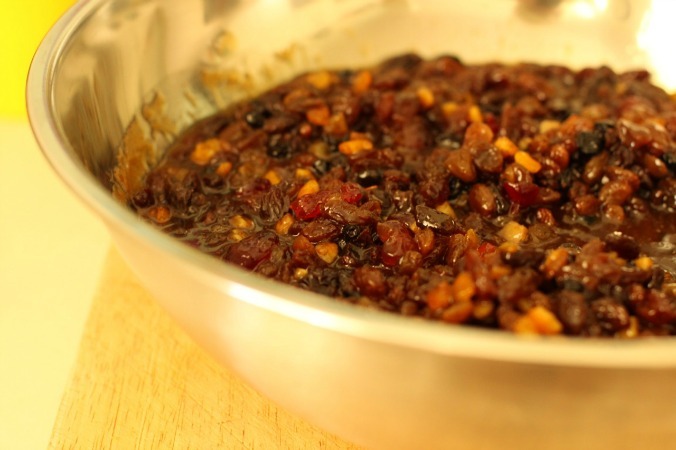 My mum always makes Christmas puddings which is a strong memory of my childhood – climbing up onto the bench to stir the mixture and make a wish. Sadly neither my sister or I like Christmas pudding but everyone would always rave about Mum’s Christmas puds which of course were served with brandy butter and a sprig of holly on top. 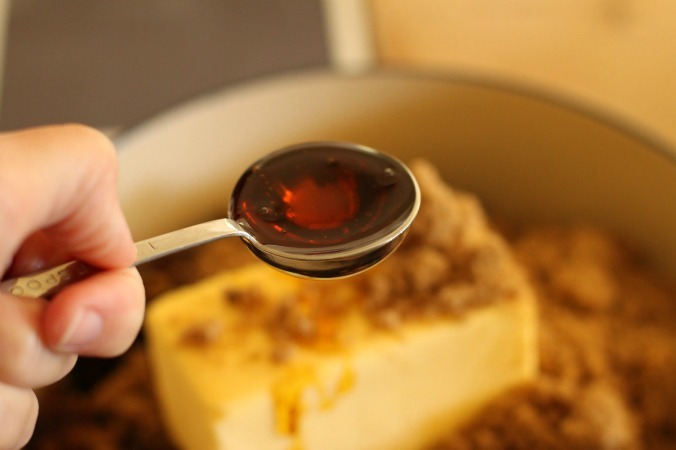 Brandy butter! My step Mum’s Mum (my step Grandma?!) made hard sauce which I think is the same thing? SO GOOD! I really hope that these traditions don’t die out over time. Our Christmas tradition if to have a date & walnut cake served warm and drowned in brandy & served with oodles of whipped cream. As we only consume it once a year, it is just the most wonderful experience. Your family will utterly <3 their made-with-love Christmas Cake. Any recipe by someone called Glad has got to be a cracker. 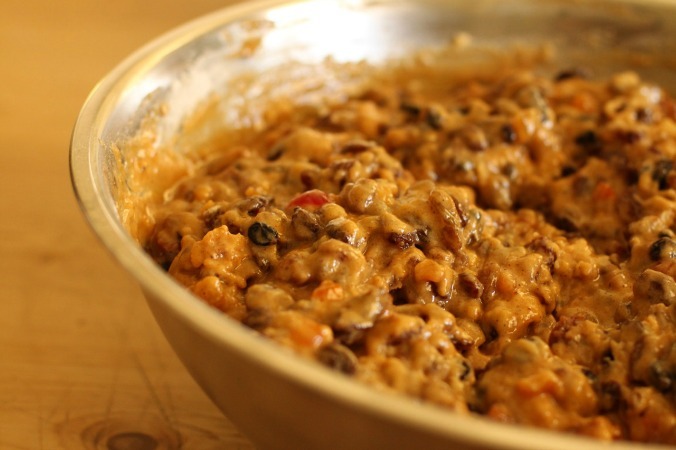 Sounds like a lovely boiled fruit cake, just like my paternal grandma Doris, used to make. Doris sounds a bit like Glad- a good old fashioned cook. I too have some of Doris’ tins and old mixing spoons with the edges worn off from use, plus some of my mum’s tins and I love them. The things Doris could make- a sponge cake so light it almost floated, and only using a hand whisk. No bingo wings for her! 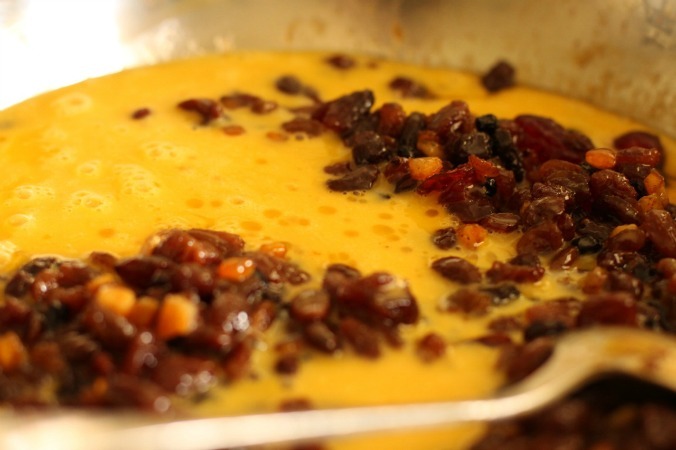 My mum and I always made fruit cakes and puddings together the first weekend in December. For us, for family who got them as gifts, for neighbours too. We’d go all day, and end up with a bench full of cakes and puddings to eat, and give away. My babies got involved in bowl licking and stirring when they came along. Mum’s gone now, and Dad too, but we still do it. My niece and nephew will come, and my two kids will join in, if only to taste, and lick the bowl. And we’ll remember Nan with them, and stir the mix and make a wish. The fruit for my cakes/puddings has been soaking in copious amounts of booze in sealed glass jars on my bench for the last month, and I’m hoarding our chooks eggs in anticipation. Long soaking makes for a very moist and rich cake and pudding. God love the Doris’ and Glad’s of the world! I think when I make my next one I am going to soak the fruit in the booze for some time before hand…someone this week told me they do it for 12 weeks beforehand!! This is one of my most favourite posts. Love it, am going to try it for sure. Tradition is the best. This is just the inspiration I needed Beth, a beautiful post – you write so eloquently about what memories are made of. I have made panforte the last 4 years but I have a 1kg bag of dried fruit and glacé cherries waiting in the pantry for me to get my act together and make a Christmas cake… I’ve got Margaret Fulton’s bookmarked. This WILL be the week I find the time! Thanks for that Beth, I will start a tradition. I have tried to make xmas cake before but had a crappy oven so it wasn’t very good. I’ve been sad since my dad passed away, so starting my own tradition is a good idea, to carry it all on hey! Cheers! Perfect thing to do Jenni – good luck! I’m going to soak this time for a bit longer too! I’m inspired Beth! I’ve never made a Christmas Cake. My Grandma was one of the local Uniting Church stalwarts and her baking was legendary. Our fortnightly trips to visit her and my Grandfather in Ipswich always meant gigantic roast dinners, homemade icecream, heavenly tarts and chocolate cake with more icing than needed so my brother and I could fight over the extra. Grandma had certificates in cooking. She used the old wood stove and my Dad (who’s 82 now)recalls her being able to pull something she was baking out of the oven halfway through to put in a forgotten ingredient and it STILL turned out perfectly. Her Christmas cakes and puddings WERE Christmas to us. A flavour and smell so evocative. Thanks for helping me remember a happy time in my life. I’m off to buy some sherry! What a lovely story Janey – thank you for sharing! That’s EXACTLY how I was…but I did it! You have to start somewhere!! Thanks Beth for the fruitcake recipe. I’ve just finished baking it with my mum for Christmas Day. It’s now cooling on my dining table wrapped in the bath towel (looks odd but I’m going with it). I wish I’d read the comments about soaking the fruit in booze before making it. But hopefully it tastes just as good anyway on Christmas day. And I didn’t soak mine last year and it was still delicious! Excellent – I STILL haven’t done mine yet! Great recipe… used it and made a wedding cake with 3 of the cakes i made (first one was for testing 🙂 I had a great rise on the cake also and firm but moist cake. Is this a dark or light coloured cake? My nana always made a dark one, but unfortunately the recipe gave us makes a light coloured one. 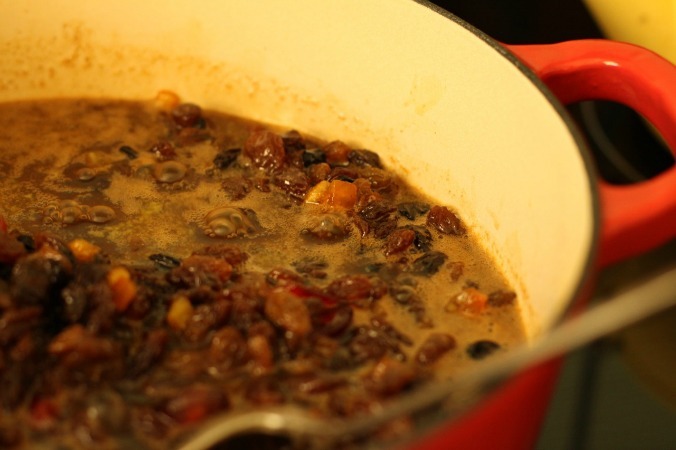 Thanks Beth for the recipe, my grandmother used to make the most delicious fruit cake and pudding. She’d have the pudding sit in a cupboard for over a month & the fruit would soak for a couple of weeks first too. I just made your cake today and didn’t see the step to cover to cook! It seems done already at 2hrs 25mins so I’ve taken it out! Hope it turns out ok! Thanks for the recipe, you have motivated me to try and make one this year. Do you think it could be split into several smaller tins for little gifts?